Father Tim Mullin hasn't had much success in bringing Blackie Norton around around to the straight and narrow. Tim and Blackie grew up together in the Barbary Coast of San Francisco, skipping mass in order to get in trouble. 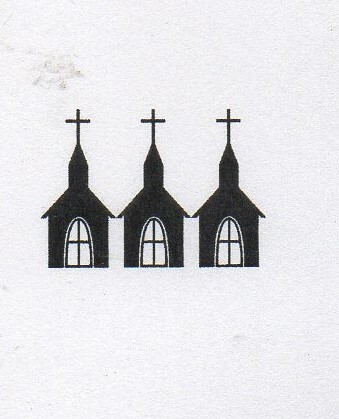 Tim became a priest, and Blackie became a nightclub manager. If you grew up in a bad neighborhood in an MGM film in the thirties or forties, you pretty much had three career paths open to you: cop, priest, or shady operator of some kind. Tim and Blackie are characters in this MGM drama directed by W. S. Van Dyke (The Thin Man) with a number of other directors collaborating. It’s set in the San Francisco of 1906 (you careful readers may have already guessed the location of the film). Father Tim is played by Spencer Tracy (the go to priest until Bing Crosby and Barry Fitzgerald took up the cloth). Blackie (the name says, "rakish," doesn't it?) is played by Clark Gable. 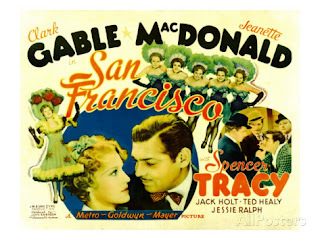 And Jeanette MacDonald plays the Gospel Bait*. Mary is a spunky young woman who left her small town minister father to come to the big city. She goes to Blackie's place to get a job as a singer and knocks everyone out with her operatic voice, but Blackie is taken aback when she rejects his suggestion that she "show some leg." Mary also quickly becomes involved at Father Tim's church, singing the hymn "Jerusalem" at a service with the boys' choir (all MGM churches have a boys' choir). It does seem rather strange that as a "minister's daughter" -- presumably Protestant -- she connects so quickly to a Catholic Church. But that Father Tim is so winning. He isn't winning Blackie, though Father Tim’s been doing his best with boxing evangelism. Blackie and Tim spar in the ring, and the priest makes with the holy sucker punches. He also invites Blackie to an organ concert since Blackie gave the money for the organ and all. But nothing seems to be working. Blackie asks Tim why he "blew me for a bunch of plastic saints?" Blackie thinks God is for the suckers at the mission, but a person should take care of himself. So when Blackie shows an interest in Mary, Tim thinks this may be God's answer. He tells Mary Blackie's "someone to be afraid of," but wishes he was a force for good rather than evil. He hopes Mary will be a good influence on Blackie. But when Tim feels Blackie’s exploiting Mary, he goes to tell Blackie off. Blackie slugs him and goes off to the opera with a solid San Francisco citizen. Mary is going to marry that upright citizen. Tim goes to the engagement party and asks if Mary is happy. She says she's happy, but the audience can tell she's not Clark Gable happy. She discovers her fiance is a jerk who’s trying to ruin Blackie and his club, so she tries to help Blackie by singing (the title song) on behalf of Blackie's club at a talent contest. Blackie says he doesn't want her help and storms out. Right after the talent contest, the great 1906 San Francisco earthquake hits. The real earthquake struck at 5:00 am. 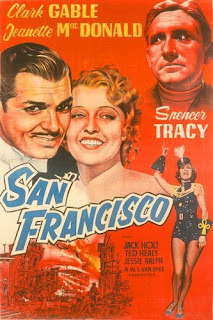 I guess they were quite the night owls in San Francisco back in the day, although this movie’s footage of the earthquake all seems to be in broad daylight, which is quite unusual in San Francisco at 5:00 on an April morning. We see everyone out on the streets, children playing on playgrounds, traffic on the street. I guess that makes for better earthquake footage than showing lots of people asleep in beds when the earthquake strikes. Blackie is in the street during the earthquake, and he goes about helping people trapped under buildings. He finds Mary's fiance under a building, rather deceased. So he goes looking for Mary. Blackie goes to Father Tim, who is working with other priests and nuns and Salvation Army workers at a hospital. He asks Father Tim if he knows where Mary is. Tim takes Blackie to a tent camp where she is leading a worship service, singing "Nearer My God to Thee." Blackie is so relieved that Mary is alive that he tells Father Tim, "I want to thank God, what do I say?" Tim answers, "Just say what's in your heart." Mary sees Blackie kneeling in prayer. Finally Mary and Blackie can be together, because they are together with God. Finally, romantic love and natural disaster accomplish what Tim's preaching and pugilism couldn't. 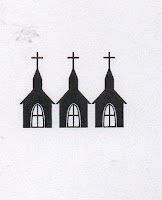 I'm giving the church in the film 3 Steeples for Father Tim's work with the survivors of the earthquake and for the way he leads the citizens of San Francisco in a rousing chorus of "Battle Hymn of the Republic" when the fires are put out. *Tim despairs of winning Blackie to righteousness, but when Blackie falls for the good and pure Mary Blake he sees an opportunity.